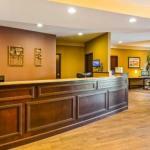 Our guests who choose the Best Western Paradise Inn enjoy easy access to the University of Illinois Memorial Stadium and Parkland College as well as complimentary breakfast and an outdoor pool. The two-story Best Western houses 62 rooms along exterior corridors. All rooms feature cable TVs coffeemakers high-speed internet access and hairdryers and non-smoking rooms are available. Grab a free newspaper in the lobby on your way to the hotel's complimentary continental breakfast. Splash in the hotel's outdoor seasonal pool shoot some baskets at the on-site hoop or work out in the fitness center. Families frequent the hotel's playground while business travelers make use of the hotel's meeting space. The hotel also provides free local shuttle service. Pets are permitted for an additional fee and parking is free. The hotel is near I-57 I-72 and I-74 in Savoy three miles from the University of Illinois and Memorial Stadium. Parkland College is seven miles away. Guests are within walking distance of restaurants six miles from Crystal Lake Park and a 30-minute drive from Lake of the Woods. Indianapolis International Airport is 105 miles away.